Instruction is given in language structure and usage, paragraph, development, short story, Shakespearean drama, poetry, and the novel. Public speaking and creative writing skills are also emphasized. Advanced instruction is given in correct grammar and punctuation usage in preparation for technical and creative writing. World literature is studied extensively, as is public speaking and creative writing. This course includes an in-depth study of the major periods of American literature. Students are encouraged to develop self-expression through composition both of poetry and prose. Students are also encouraged to develop the ability to analyze and critique literature. This senior-level advanced writing course covers the areas of analysis, research, comparison, exposition, and persuasion. This class combines English literature, vocabulary, and writing, and prepares students for college and careers. 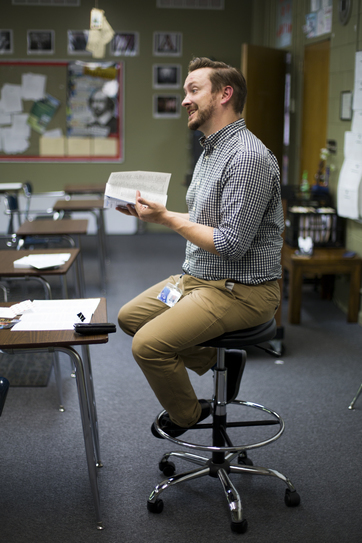 This one-year Advanced Placement course engages college-bound seniors in the careful reading and critical analysis of classic and contemporary American and European literature. Through the active reading of a rigorous selection of texts, students will deepen their understanding of the ways writers use language to provide both meaning and pleasure for their readers. Writing assignments focus on the critical analysis of literature, including expository, analytical, and argumentative essays. To that end, writing instruction focuses on developing coherence, unity, precision, structure, and stylistic maturity. This course is designed to prepare students to take the AP English Literature and Composition exam at the end of the school year. A fee is required to apply for the AP exam. Applied English I is designed for freshman students who need to develop better reading, writing, and organizational skills before merging into our standard English program. Students will read a variety of material including drama, short stories, poetry, and novels. This course focuses on basic English conversational skills, speaking practice, reading, and writing. Daily life skills vocabulary and conversational phrases are also emphasized. Students are also introduced to everyday living, cultural differences, and the general geography of North America. Students will move from this course into regular English courses as their English skills improve.